A Video Guest Post by Dr Lewis Liu, CEO and co-founder of legal AI company, Eigen Technologies. Readers will probably have heard of Eigen and the work it is doing in the legal AI doc review space, but perhaps have not had a chance to hear its inspiring founder speak. 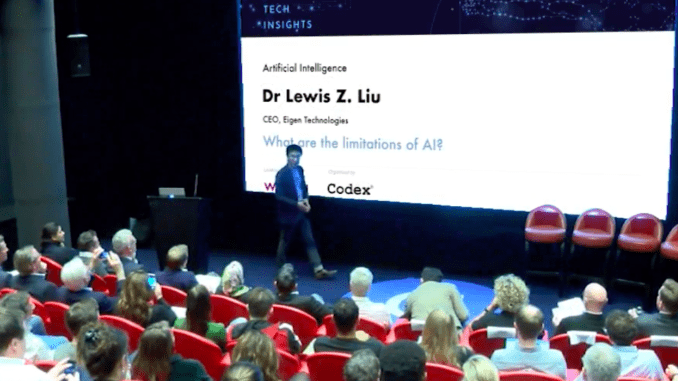 Here is a short video presentation (13.27 mins) recorded at a recent Codex.com event* in London. ‘So much has been said and written about AI that sometimes we lose sight of what it can actually do. We are living through a time in which AI is dramatically enhancing our ability to take in vast sums of data, process it, and use it to drive decision-making. Eigen’s role in this revolution is based on our ability to accurately extract qualitative data from documents at scale. However, we should not lose sight of the limits of these new technologies. We believe firmly that the best combination for accurate data extraction at present is human + machine. Since Eigen’s founding, we’ve been focused the big questions: How deep is the power of AI? What are its limits? What does the future hold?